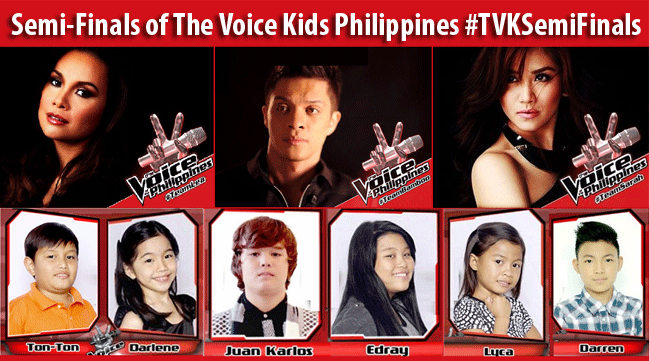 This is the next level of competition for the 6 young artists who made it to the Semi-Finals of The Voice Kids Philippines with hashtag #TVKSemiFinals since they will be competing live tonight July 19, 2014. The six kids will face each other on the live semi-finals. In the end, there will only be 4 of them who will survive and be included in the list of the Final 4 which will be next week. The viewers have a part in choosing the winners for the said competition. The grand champion will receive 1 million pesos plus a recording contract of one year from MCA Universal. Tonton is considered by her Coach Lea as someone with angelic voice. This talented young artist was once helping her mother sell street foods and now on the stage performing to show his talents. He sang “One Day in Your Life” by Michael Jackson wherein he was able to impress his coach. Coach Bamboo said that he has a sweet voice with a good aura. Also, he had a great song choice. His coach Lea was very proud of him because of being an improved performer. Vhong Navarro inspired Tonton and said that he is a good child to his mother. Edray is one of the most powerful singers in the competition. This Bamboo’s girl was surprised by Xian Lim and when she was asked by host Alex Gonzaga regarding the things that she wanted to say to Xian, she could not speak any, in short, she was speechless. She sang “Beautiful” by Christina Aguilera that really impressed the people, most especially Bamboo. Coach Sarah said that she sang very beautiful and she never let anyone tell her what she should be. Coach Bamboo said “you’ve shown me the big smile tonight” for a wonderful performance. Darren went from Canado to the Philippines just to join the competition. Being one of Coach Sarah’s top performer, Darren when it comes to singing was taught by his coach to connect and not just sing. Darren was surprised by Marin Nievera during a video message saying he has to sing the song as if he was the one who wrote it. Darren did an amazing performance of “One Moment in Time” that really awed the audience and made his coach very proud of him. Coach Lea said only one word to describe Darren and it was “phenomenal.” Coach Sarah said that he performed like he was in grand finals. One of Bamboo’s pride, Juan Karlos Labajo was taught very well by his coach in performing. He was reminded not just to stand but also to show performance more than vocals only. His very inspiration in singing and joining the contest was his mommy. Juan Karlos was surprised by Kim Chiu who allegedly was his crush. Juan Karlos performed “Sway” that really gave a good vibes inside the venue. After his peroformance, Coach Sarah said that he was charming and with good personality. Coach Bamboo was amazed of his performance and said that it was all natural and it was really him. Lyca has big dreams in life and for her family that is why she joined The Voice Kids. During the rehearsal, there were times when she simply get out of tune that is why her coach needed to do a lot of adjustments. She was surprised by Angeline Quinto who happened to be her idol. Lyca performed “Pangarap na Bituin” that made coach Lea say “pangarap na naging katotohanan.” Coach Sarah said that she was a big inspiration to her. Before Darlene’s name was called, there was shouting inside the venue. It means to say that this young artist is very popular. This is probably of her intelligence and energy. Darlene sang “I Will Always Love You” that made her very emotional on the stage. Darlene cried at the end of her performance because according to her, she remembered he grandfather. Coach Bamboo said that she has a good performance and he liked eh diction. Coach Lea who was also emotional that time and said that she didn’t have any problems with Darlene since the start of the competition. Going online is also possible so that you can vote by visiting: http://thevoice.abs-cbn.com/vote. Who is your favorite young artist? You can start voting now!